As I unboxed them I was immediately enamored by the paint on these things. It has a pearlescent glow to it. It is also smooth to the touch. The photo probably does not do it justice. I also noticed that the imprint on the pencil is crisp and clear. The lettering is thin and clean. 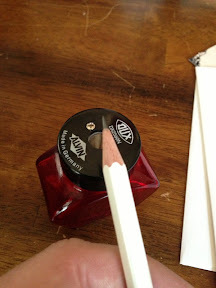 I sharpened the first pencil with my favorite hand sharpener (shown) and it took a point nicely. The smell of the incense cedar is faint. 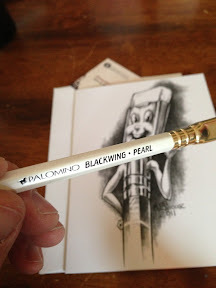 You can see in the photo at the top of this post that this pencil does write a slightly darker line than the Palomino Blackwing 602. 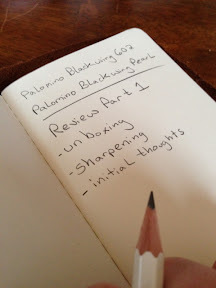 Also you may notice I experienced a small bit of lead crumble on the 602 when I got to the "L" on Blackwing. This was also with a freshly sharpened 602. 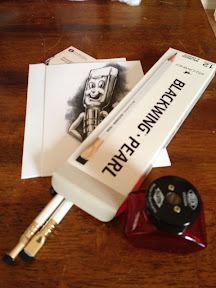 My initial thoughts on this pencil are positive. I will run the pencil through full paces tomorrow at work, and possibly tonight in my journal.